Powerful pictures of your project. Schedules, tasks and resources as you've never seen them before. The best way to plan projects, manage resources and track progress. No question. It's hard to believe how easy it is to configure your projects with simple click+drag actions. Clear, flexible, innovative charts that everyone can understand. Communicate to all stakeholders with customizable view options. Display compact high-level overviews and drill down to individual details. Resource-based Tufte Chart, which provides seamless integration of people, schedule, tasks and dependencies. Tufte Chart "swim lane" layout clearly shows who is doing what when. Tufte Chart also highlights the dependencies between people not just tasks. 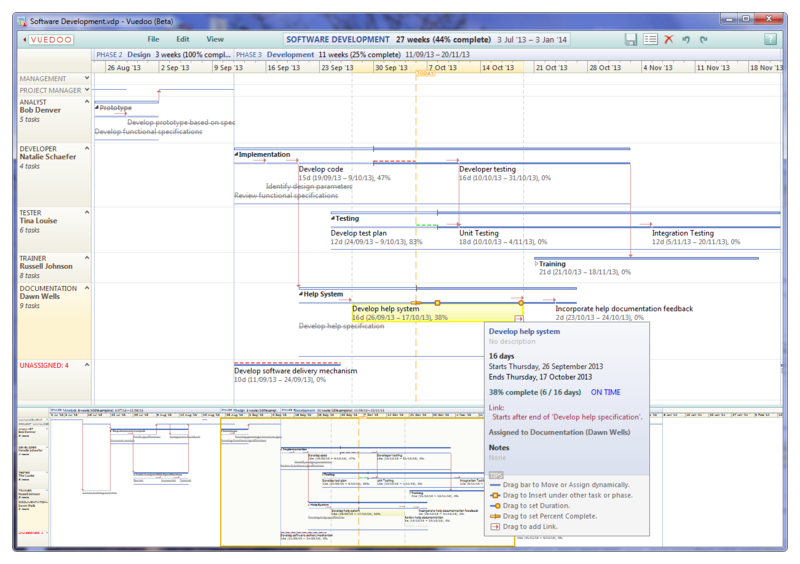 Task-based Timeline Chart, which displays compact horizontal time sequence of tasks. Enhanced Gantt Chart which incorporates some of the advanced features of the Tufte Chart. Project templates to get you started, with a range of industries and processes. Beautiful, intuitive interface — learn how to use in 10 minutes. Unique Scroomer control for smooth scrolling and zooming. Keep your eye on the big picture at all times with separate overview of the whole project. Options to choose which data to display in the charts. 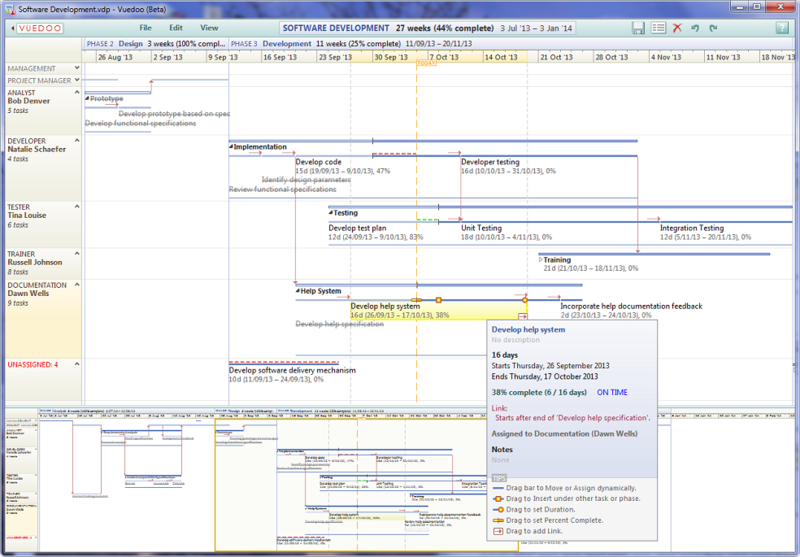 Multi-level task hierarchy with special support for project phases along the timeline. Project milestones displayed along the timeline at the top of the charts. Links to create scheduling dependencies between tasks. Tiny project file size which loads instantly. Free Reader App saves you money! Share your project plans with all stakeholders, without having to buy extra licenses. And, unlike other project planning software, Vuedoo Reader provides more than just a static printout or .jpg - it provides full access to all the dynamic view and text options that the paid app has! The Reader will always be free, and has nearly all the features of Vuedoo except edit and save. "I have been operating a small consulting business for 10 years. When bidding for work, I am frequently required to prepare detailed project plans. I now use Vuedoo exclusively for this purpose and I can honestly say that I would be lost without it. It is by far the best program of its type on the market and it allows me to present project information to customers in a concise and crystal clear graphical form."